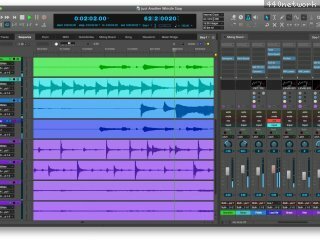 Digital Performer est un système séquenceur MIDI & audio numérique. Il permet d'éditer, d'arranger, de mixer, de traiter et de masteriser des projets audio multipistes. Il permet également d'enregistrer et de lire simultanément plusieurs pistes audio numériques et MIDI. Digital Performer version 9.5 is now shipping as a free update for all DP9 owners and introduces ZTX PRO™ technology: cutting-edge audio time-stretching and pitch-shifting DSP developed and refined through years of advanced R&D by the renowned engineering team at Zynaptiq GmbH. DP 9.5 also adds a new Effect Performance window, which monitors the processing load of all currently instantiated virtual instruments and effects plug-ins, allowing you to identify and manage plug-ins that impose high processing demands on your computer. Plug-ins can be sorted by name, processor load or the exact location (bar and beat) in the sequence time line at which they reach peak processing. Each plug-in is identified as either pre-gen or real-time, with hints as to why any plug-ins are currently running in real time. �� Fixed a bounce to disk crash caused by an issue involving non-active VST effects. �� Fixed a problem where audio would sound choppy after inserting a post-fader effect. �� Fixed a crash involving Melodyne. �� Optimized code that could impact opening projects with a large number of tracks. live state of the sustain pedal. Next-gen Pre-gen™ engine — DP's Next-generation Pre-gen engine transparently pre-renders audio output from virtual instruments and plug-ins to dramatically reduce their CPU load, allowing you to run many times the number of plug-ins and virtual instruments than in previous versions. Reduced latency on OS X — DP’s host buffer latency has been cut in half, resulting in industry-leading overall latency performance. In a round-trip latency (RTL) test using a MOTU 1248 Thunderbolt audio interface, DP achieves roundtrip latency of 1.6 ms with a 32 sample buffer at 96 kHz. Enhanced Windows drivers — The latency of the WASAPI (Windows Audio) driver has been significantly reduced. This improves audio I/O latency and virtual instrument performance. The CPU load of the sample rate conversion used in the Windows Audio driver has also been substantially reduced. Small buffer optimization — DP's MOTU Audio System (MAS) engine processing has been optimized to better support operation at smaller buffer sizes (for both Mac and Windows), for even lower latency performance overall. Hardware Insert plug-in — DP’s new Hardware Insert plug-in functions just like other DP effects plug-ins, but loops the channel’s audio signal to a piece of outboard hardware, with latency compensation, for external processing. This allows you to easily incorporate outboard gear into your DP effects chains. SMPTE-Z plug-in — The new SMPTE-Z plug-in generates Longitudinal Time Code (LTC) while locked to DP’s timeline or while running independently in Freewheel mode. Time code can be routed anywhere via the audio track’s output assignment, allowing you to achieve accurate time code sync in a wide variety of situations. 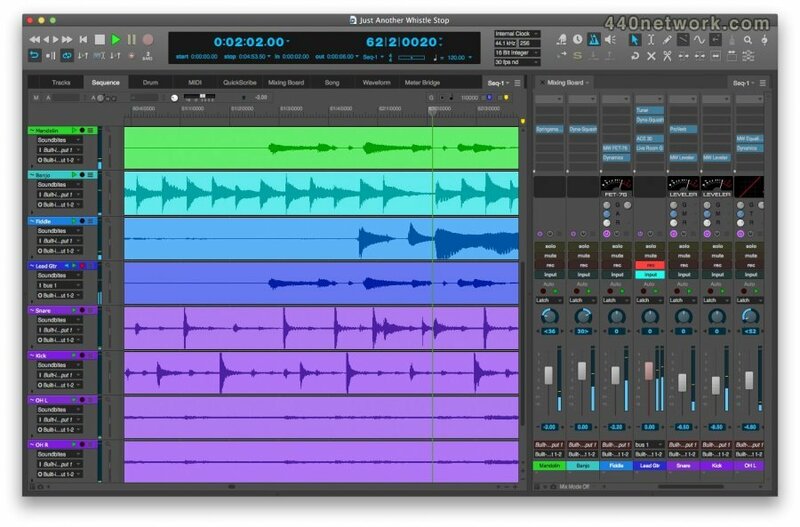 Workflow enhancements — Dozens of additional workflow enhancements include a new pre/post fader metering option, faster switching between large sequence chunks, simplified audio hardware settings, improved compatibility with Avid Artist Mix and other Eucon control surfaces, and much more. Improved selection in lanes in the Sequence Editor. Allow MIDI Learn to target mixing board controls. Improved performance when opening the Sequence Editor. Improved saving of VST presets. Addressed an issue where plug-in tails might get clipped when bouncing with iZotope Ozone, UVI Relayer and others. [Mac] Allow MMC via the IAC bus. Changed "Fix partial measures" back to on by default. Show Marker grid lines in the Tracks Overview like other editors. Increased the idle rate of VSTs, which should improve the redraw speed of plug-ins that depend on it, such as Serum. Updated the Japanese documentation, including the User Guide. [Win] Fixed right-clicking in MAS plug-ins. More performance improvements for the Sequence Editor with lots of tracks. Updated to the EuCon 3 SDK. Fixed an issue where not all VST instruments were properly loaded as instruments. Added scrolling to change values in MX4. Tweaked contrast and colors in the Nine theme. Disable the buffer size menu during playback. Added the Japanese plug-in guide. Now included with DP, MX4 is a powerful 64-bit virtual instrument plug-in featuring a hybrid engine that combines several forms of synthesis, including subtractive, wavetable, frequency modulation (FM), amplitude modulation (AM) and analog emulation. Included is a new EDM-inspired soundbank with 120 new presets programmed by synth guru Erik Norlander. New version 9 plug-ins include the meticulously crafted MasterWorksTM FET-76TM emulation of the classic 1176 limiting amplifier (revisions D/E), MultiFuzzTM model of Craig Anderton's seminal QuadraFuzzTM distortion kit from the 70's, MicroGTM and MicroBTM polyphonic octave generators for guitar and bass, and the mind-blowing MegaSynthTM subtractive synth processor, which lets users turn their guitar into a synthesizer. MegaSynth combines polyphonic octave generation with flexible signal routing, envelopes, LFOS, a pattern generator and macros. �� Automation lanes in the Sequence Editor — Display audio and MIDI automation data (volume, pan, plug-in settings, etc.) in separate lanes below each track for easier viewing and editing. Show and hide as many lanes as you wish. �� Spectrogram display in the Sequence Editor — View the spectral content of each audio track, side by side with their waveforms, directly in the Sequence Editor timeline with a colorful, informative visual representation of the frequency content of your audio material. Digital Performer 9 — Press Release Page 1 of 3• Retina display support — View DP’s carefully crafted UI themes like Carbon Fiber, Producer and the all-new DP9 theme in stunning detail on the exceptionally high image resolution of your Mac’s Retina display. �� MusicXML export — Export your DP QuickScribe notation scores as a MusicXML file, which can then be imported into popular music notation applications like FinaleTM and SibeliusTM. QuickScribe’s renowned notation transcription, along with dynamics and many other musical symbols, are preserved during the file transfer. �� Create Tracks command — Add many tracks to your project in one step, even different types of tracks (MIDI, audio, aux, master faders, etc.) all at once. �� Floating plug-in windows — Keep plug-in windows in front of all other DP windows. Set the floating preference globally or choose to float on a per-window basis. �� MIDI Learn for audio plug-ins — Map knobs, faders and switches on your MIDI controller to audio plug-in parameters. Use Digital Performer’s powerful Custom Consoles feature to access advanced programming for the connection. �� Mute MIDI Notes — Use the Mute Tool to temporarily silence both audio regions and MIDI notes, including multiple selected notes. �� Project Notes — Save text notes in your DP project, rather than a separate text document. Log production info, keep a To Do list, build up liner notes. �� More searching — Find Markers, Chunks and plug-in preferences faster with newly added search fields. �� Added new Guided Lessons, which provide integrated, interactive tutorials. See the new Guided Lesson project in Application Support, or download it as part of the updated tutorial materials from motu.com/download. �� Improved operation with multiple Core Audio devices running under 10.9. �� Sends can now be dragged and dropped in the mixer, just like effect settings. �� Support for Japanese text input on Windows. �� Improved importing crossfades from OMF and AAF files. �� Improved operation on Windows with drag and drop, window focus, instrument aux assignments, and the Movie window. �� Fix for an issue on Windows where Digidesign Accel HD hardware wouldn't change sample rate. �� Addressed several issues related to Movies and Load. �� VIs now retain their aux assignments when duplicating a chunk. �� Improved compatibility with Scuffham S-Gear plugins. �� Video output offset now works with MOTU video hardware and DV output, even when DP is resolved to an external time base. �� Improved compatibility with UAD plug-ins on Windows. �� MIDI tracks now retain output assignments to V-Rack VIs when loaded from a document containing the same V-Rack. �� Added "At Wiper" and "At Original Time" versions of Paste, Merge, and Splice. Refer to the commands window for their default key bindings. �� Performance improvements for video playback on Mac OS X. �� External video (DV and sample-accurate MOTU video hardware) can now sync to MTC or LTC. �� External video offset now applies to MOTU video hardware output (in addition to DV output). �� Latencies are now updated properly before bounce-to-disk. �� Improved latency compensation for side chains and virtual instrument (VI) aux outputs during bounce to disk and pregen mode. �� Improved DP's responsiveness to scroll wheels (on both Apple products and third-party products). �� Stability improvements in the Effects Chooser. �� Improved Audio Unit (AU) plug-in support (Omnisphere in particular). �� Improve compatibility with Vienna Symphonic Library (VSL) and Vienna Ensemble Pro (VEP). �� Selection info times are now stored per chunk rather than globally, restoring DP5 behavior. �� Fixed copy and paste behavior for soundbites with sync points. �� Restored the "None" start-up document option to the Mac version. �� Mixing board volume and pan are no longer chased for play-disabled MIDI tracks. �� Command/Ctrl-up/down arrow now zoom in the tracks overview. �� Improvements to color preferences and their effect on audio waveform colors. �� MIDI notes are no longer dropped during MIDI controller overdub recording. �� Autosave improvements: you can now limit how many auto-saves will be maintained by DP. �� Added support for the OSC control surface plug-in for 64-bit operation on Windows (required for DP8's iPhone app). �� Improved MP3 export speed. �� Option-clicking a window's close button now closes all similar windows (not all windows). �� AU automation values can once again be edited by typing into value boxes. �� Improved audio performance while slaved to MIDI Time Code (MTC). �� Double-clicking on soundbite in the Tracks overview once again scrolls to that soundbite in the sequence editor. �� Fixed Bounce to CD on the Mac. �� Addressed an issue with Custom Consoles when running DP in 64-bit mode. �� Fix for a crash with calculating waveform overviews. �� More accurate text in the crash reporter. �� Fixed a crash that would occur after switching to QuickScribe on certain computers. �� Improved hardware compatibility with Focusrite, Avid Mbox2, and Lexicon audio interfaces. �� Better support for non-US computer keyboards. �� Dragging MIDI data from plug-ins into DP (e.g., from Superior Drummer) now works. �� Improved ASIO error reporting. A 30-day demo period is now available, as explained earlier in this document. Digital Performer is now available for online purchase from the motu.com/store. DP's new welcome window appears at launch and provides quick access to recent files, new project templates, training resources, and MOTU news. The ability to export MP3's is now built in to DP and no longer requires the LAME framework (or any extra setup). If a movie is fullscreen, switching chunks now preserves fullscreen viewing. Improved performance when the Movie Track is visible. Improved video scrubbing. Waveform drawing is now smoother at certain zoom levels. Improved bounce to disk in projects with VST plug-ins. Improved stability with Kontakt 4 and 5 under 64-bit operation. Improved compatibility with VEP, EastWest Play, Spectrasonics Omnisphere, and Mac OS X 10.8's AUSampler. Addressed an issue where abutting MIDI notes might not play back properly. Autosave now creates a sub-folder in the project folder and saves incremental versions there. Many improvements in waveform drawing and editing. Fixed entry of diminished (°) and major 7th+ chord (?) symbols in QuickScribe. Merging chunks in a song now takes the tempo mode from the song itself. Effect categories in the Effect Chooser now contain all variants of a plug-in, not just the one added. Restored scroll wheel sensitivity to be more like DP 7 and earlier. The following feature has been restored: if tracks are selected when switching to the Mixing Board or QuickScribe windows, only those tracks are shown. Fixed an issue with timestamps in broadcast wave files. Native 64-bit operation — Take full advantage of your 64-bit computer system. VST / Rewire support — On both platforms for easy project exchange. New video engine — Supports full-screen video, 720/1080 HD, and MOTU video hardware monitoring. Punch Guard™ confidence recording — Captures extra time before and after punch points. 15 new themes — Artistically crafted UI designs including Hi-Fi, Arctic, and None More Black. In-line control panel — Conserves precious screen real estate. Multi-format plug-in management — Organize, manage, and quickly search for plug-ins in multiple formats. Cross platform — Now shipping for Mac OS X. Windows 7 support coming soon. This is a maintenance update to Digital Performer 7.23. This release includes compatibility with Mac OS X 10.7 (Lion) and other improvements. Please refer to installer Read Me for changes and complete system requirements. Le problème de l'arrêt de la lecture lorsque un Instrument Virtuel est lancé ne se produit plus. meilleure gestion de la réponse impulsionnelle pour le plug-in Proverb. la lecture des fichiers audio à partir d'un CD est possible ainsi que l'ouverture de Projets au format Digital Performer. Meilleure analyse de la forme d'onde des fichiers et meilleur aperçu de celle-ci. Meilleure gestion des I.R. (impulsion de réponse)dans la ProVerb (reverb à convolution). Sauvegarde et chargement correst des Présets dans le MasterWorks Leveler (compresseur) . Possibilité avec la touche Shift-+ glissement des points graphiques de l'EQ sur l'interface du plug-in MasterWorks EQ. import du bundle au cours de l' operation de chargement; sauvegarde des fichiers du Projet concerné . This release includes an audio pitch automation reference setting and more, as well as features and enhancements first introduced in DP 7.2 and earlier. Changement complet de l'interface utilisateur de Digital Performer en un seul clic. Choisir des thèmes tels que fibre de carbone, le Zen, le plasma et la production. Peaufinez couleurs d'affichage de forme d'onde et personnaliser vos propres indicateurs de niveau dans la table de mixage. Reconnaissance du clic-droit à l'aide d'une souris à plusieurs boutons pour les fonctions essentielles . Recherche rapide d'un fichier audio, raccourci-clavier ou autre en quelques secondes en tapant juste son nom depuis une fenêtre de recherche . This maintenance release includes expanded control surface and MIDI device configuration options, improved waveform overview construction, and more, as well as features and enhancements first introduced in DP 7.1 and earlier. Improved control surface configuration options enable the use of applications such as Saitara Software's AC-7 applications for iPhone and iPad. Get your axe in tune quickly with DP's new Tuner plug-in. Four new power amp models give you guitar tones extra punch: preamp, vintage, classic, and modern. Dozens of guitar tone effects chains are now provided as single, convenient presets. View the contents of track folders at a glance, including track color and type of data. Select, cut, copy, paste and otherwise edit the contents of track folders, just like individual tracks. Track folders now have play-enalbe, solo, lock, and other track controls, just like individual tracks. Save, recall, and manage chains of insert settings as single presets, including guitar effects chains and virtual instrument chains that include effects. Many presets are provided for drums, guitar, bass, vocals and more. When you fill the last insert, or load a new insert setting preset, extra insert slots are automatically added as needed. New plug-in presets have been added, especially for DP7's guitar effects plug-ins. Scale, flatten, or offset MIDI or audio automation data within a selected time range in one simple step. Enjoy peace of mind as you work: your creative efforts will always be backed up. Get immediate notification about about new available updates as soon as you launch DP7. Hold down the command key when adjusting many controls in DP7 for fune-tuned adjustments. Speed your workflow with new shortcuts for nudging MIDI notes up/down, the QuickFilter, zooming and other features. Import Core Audio (.caf) files via simple drag and drop. Digital Performer is fully qualified for operation with DAE version 8.0 to 8.0.3. This 2nd maintenance release includes several highly-requested program enhancements and optimizations, including the new QuickScribe features, keyboard shortcuts, and count-off click options first introduced in 7.01. This is a maintenance update to Digital Performer 7.0. This release includes a new Countoff mode, QuickScribe Editor improvements, and more. Please refer to installer Read Me for changes and complete system requirements. A meticulously detailed guitar amp emulator modeled after all-time classics from Fender® and Marshall®. A superb physical modeling speaker cabinet emulator with four mixable mics (close, near and far) and 3-band EQ per mic. A new suite of stunningly accurate classic guitar pedals modeled after all-time favorites from Boss®, Ibanez® & others. Control DP's multi-band graphic EQ and vintage dynamics processing directly in each Mixing Board channel. Gain instant access to all mixer channel settings for the track you are working on in any Editor window. Create and print lead sheets, complete with lyrics and transposable chord symbols. Resize the Counter window to any size you wish, even the entire width of your screen. Display markers in large type in the resizable Counter window. Use markers as a teleprompter for lyrics during live performance or recording sessions. Display V-Rack virtual instruments and effects side by side with disk tracks in the Mixing Board. Type in lyrics directly below notes on the QuickScribe page. Or paste them into the Lyric window from your word processor and flow them into a track with one click. Add complex chord symbols directly on the page and transpose them at any time, together with or independently from notes. Numerous enhancements give you even more control over the look of your score and help speed your notation workflow. Industry-leading support for operation as a complete software front-end for Pro Tools | HD systems. Get instant access to mixer channel settings in any editor window that follow the track you're working on. A new ultra-fast, CPU-efficient sample rate conversion algorithm delivers increased precision, efficiency, and transparency, with an astonishing 138 dB signal-to-noise ratio. All crossfades are now computed in real time for lightning fast edits. Support for the industry standard Wave64 extension to the Broadcast WAVE file format lets you record and import audio files larger than 4GB. Raise, lower or write automation moves within any selected range, preserving everything before and after. Route side chain inputs to all your favorite third-party Audio Units plug-ins. Mise à jour de maintenance comprenant diverses améliorations et optimisations avec, entre autres, une nouvelle fenêtre pour la configuration des raccourcis, de nouvelles options pour le flottement et la transparence du panneau de contrôle principal ou bien encore les modes manuel ou automatique pour la durée des notes dans le QuickScribe Editor. This maintenance release includes numerous program enhancements and optimizations, including the handy new Track Inspector, new preferences for running plug-ins in real time, enhancements to Final Cut Pro XML interchange, improved on-line help, new shortcuts for configuring info windows and info bars, and many other program improvements and optimizations. nouvelle option dans le menu Project > Add Instruments Tracks nommée Add Instruments... : ouvre une fenêtre de dialogue permettant de choisir combien d'instruments à ajouter, combien de pistes MIDI assignées à ajouter, etc. Les pistes Surround dans le Mixing Board affichent les niveaux surround. six nouveaux plugins instruments : BassLine, PolySynth, Modulo, NanoSampler, Model 12, Proton. Fonction 'Pitch Automation' permettant de corriger l'audio en temps réel : transposition de notes individuelles, changement de tonalité de pistes entières. Fonction 'V-Racks' permet de charger les plug-ins et instruments virtuels une seule fois et d'y accéder depuis toutes les séquences du projet, sans avoir à gérer plusieurs instances du même plug-in avec les mêmes réglages. MasterWorks EQ : égaliseur "vintage"
en revanche sur G4 ou G5 bipro ce soft est une merveille , rapide fluide efficace on va droit au but , mais j'ai pas de birpo pour le moment . quand meme un point noir au niveau de l'edition audio qui meriterais d'etre plus performante . Avec un G5 bi pro , pas de probleme , pas de latence , tout baigne . Sur un powerbook alu 1 ghz, os 10.2.7, 768 mo RAM, motu 828 : la maj 4.12 a résolu certains problèmes : faders collants, bug sonic modulator, peut être une meilleure gestion cpu (à vérifier). Pour moi, il reste impossible de jouer des projets de taille moyenne (16 à 24 pistes mono + 1 à 4 stereo) avec un buffer à 256. Les instruments virtuels font vite monter la pression sur le cpu. Le meilleur soft audionumérique du marché 100% fiable. I don't know where y'all got the information, but Digital Performer has not been discontinued by MOTU. And there is no demo. Having said that, it is the best DAW out there! Excellent workflow that is completely customizable to however you work best. DP rocks!! Audio editing like in pro tools, but more tracks. The best just got bester! Super intuitive, fast work environment. Easy to customize. Works like a charm with a dual 1.25 G4 and Panther 10.3.1! Driver MIDI pour les interfaces MOTU. USB MIDI Driver pour les interfaces MOTU USB, USB Fastlane, Micro express, Express XT et MIDI, Timepiece AV. La console ClockWorks est incluse dans ce package. Driver pour interfaces MOTU PCI. Drivers audio pour les interfaces audio Motu PCI-324 et PCI-424. Pour l'interface PCI-324. Contient les drivers audio et la console pour l'interface audio Motu PCI-324. Pour l'interface PCI-424. Contient les drivers audio et la console pour l'interface audio Motu PCI-424.